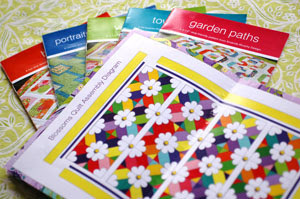 Amanda Murphy Design: My pattern line is shipping! So they should start arriving at shops within a few days. Interested shops can email me; as shops order my patterns I will be adding them to my webpage. If you choose to buy the patterns from a distributor, please email me to let me know you carry them and I'll add you to the list. In response to inquiries, I do not carry my fabrics - I leave that to Robert Kaufman. You can order "Veranda", the fabric line that I used for all the patterns, now for August delivery. Please make sure to order ahead of time to ensure you get the fabrics.